Today is Forged Friday at New Species CrossFit. We are here as athletes and Americans to exercise our freedom. It is important to never forget the men and women that provide the very freedom which allows us to stand here today. 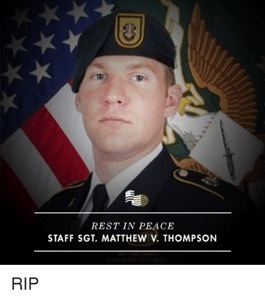 Staff Sergeant Matthew V. Thompson, died August 23, 2016 while serving during Operation Freedom’s Sentinel. Staff Sgt. Thompson was 28 years of age of Irvine, CA. He was assigned to 3rd Battalion, 1st Special Forces Group (Airborne), Joint Base Lewis-McChord, Washington. died Aug. 23 in Helmand Province, Afghanistan, of injuries caused by an improvised explosive device that detonated near his patrol while conducting dismounted operations. Please take your training to a higher level today in order to honor this American Hero. Perform the following within 1-minute as fast as possible. Once completed REST in front rack position for remainder of that minute. Then rest :30 seconds completely unloaded. Perform this for 10 Rounds.